Loading up the pens with Noodlers "The only eternal black ink. Bulletproof on cellulose paper, yet washes off plastic. Water based ink". Funny thing, the minute, I uncapped the Noodlers, a huge whiff of seemingly alcohol rose from the bottle. I got a brush and started to work in the moleskine. Not as dense as india ink. Beads up initially..not badly but not the immediate sink in but maybe because the moleskine paper is a little hard. I need to pull out some Stonehenge or something else to run in parallel. Goes on nicely. Thin like Quink (think fountain pen), but much denser. More later on the experimentation. Gotta look at Russell Cobb's work as a reference to the brushwork etc. 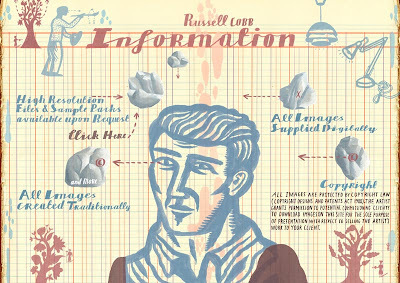 He is so cool--working many different notebooks all at once, scanning them in and turning it into all sorts of illustration (image above is from Russell Cobb's website). PSPrint sent me a little love note. Half my order is in transit already (UPS)from California. Lets see how long it takes. Got the work up at The Ispot and Portfolios.com. I was wrong about Portfolios.com and not having any offers...they have some $$ off print jobs etc. Wrote the folks at the Ithaca Art Trail and also that of the State of the Art Gallery and hope to hear from them to get the work "out there".